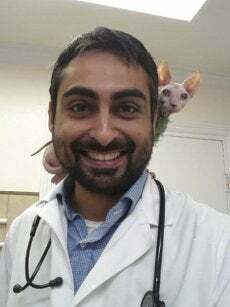 Dr. Kahlon joined our team on May 2016 after earning his DVM from Guru Angad Dev Veterinary & Animal Sciences University (GADVASU) in India and also is certified by American Veterinary Medical Association. His decision to pursue veterinary medicine was inspired by an experience he had when he was a teenager. At that time, he had a pet named Rimpy that died as a result of an unknown sickness and the lack of proper veterinary care. Also at that moment, he decided that he wanted to become a veterinarian so he could prevent others from having the same experience. Dr. Kahlon is the proud pet parent of a chihuahua/miniature pinscher mix named Brownie. His professional interests include dermatology, soft tissue surgery and emergency care medicine. In his free time, he enjoys watching TV, reading, playing with his dog, hiking and listening to music.